Two U.S. swimmers accused of fabricating a story about being robbed at gunpoint during the Rio Games landed in Miami from Brazil early on Friday, a Reuters witness said. 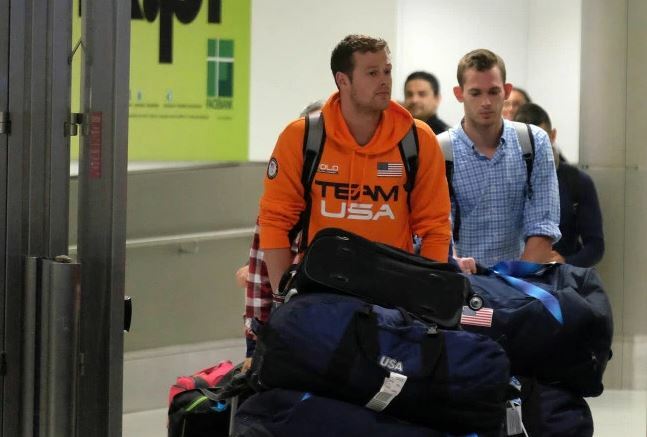 Jack Conger and Gunnar Bentz were moved to business class and covered themselves to avoid the media during an overnight flight, after they were jeered leaving the Rio airport. Ryan Lochte, the most outspoken about the alleged robbery, is already in the United States and Jimmy Feigen was still in Brazil hoping to secure the release of his passport. The incident, for which the U.S. Olympic Committee (USOC) apologised late on Thursday, has embarrassed the host city, angered the police and government and dominated news coverage of South America’s first Olympics. The Rio-based O Globo newspaper said a Brazilian judge had required Feigen to pay 35,000 reais ($11,000) to the Reaction Institute charity. Reuters did not independently have access to the judge’s decision. Lochte said in a statement on Sunday that a robber had put a gun to his forehead and demanded the group’s wallets after going to a party after they finished competing. His comments fuelled criticism of Games organisers after the sporting action has competed for headlines with a series of muggings and armed robberies of high-profile athletes and visitors in Rio de Janeiro, including two government ministers. However, Brazilian police pulled Bentz and Conger off a plane on Wednesday night and took their passports, seeking clarification on the incident. Police said there was no robbery. The USOC later confirmed police accusations, including that one of the swimmers had vandalised the gas station after the group stopped there to use the bathroom during a taxi ride back to the Athletes’ Village on the way home from a night of partying. In revised testimony that news site G1 had access to, Bentz and Conger said they were not robbed. Instead, they said Lochte had vandalised a local gas station early on Sunday and had an altercation with a security guard. The three other swimmers in the car tried to leave as quickly as possible because they feared Lochte would cause more damage, according to the revised testimony. Lochte has not been seen since he left Brazil, aside from giving an interview to NBC’s Matt Lauer that has not aired. It said it would further review the incident and assess any potential consequences for the athletes. USA Swimming said it could also take possible action. Bentz and Conger caught a connecting flight in Miami, walking through the airport in matching backpacks, a Reuters witness said. Conger kept headphones on and wore a bright orange team USA hooded sweatshirt.